We are unable to hold our January 2016 meeting at Napier Hall due to renovation work. However, we will be holding our plant auction at the nearby church of St Stephen's with St John, 38-42 Rochester Row, SW1P 1LE. This is located at the northern most corner of Vincent Square. Doors open for plant and bidder registration at 1:00pm and the auction will begin promptly at 2.00pm. Members may bring four plants each to be auctions, six per family membership and 10% of proceeds goes to the society. 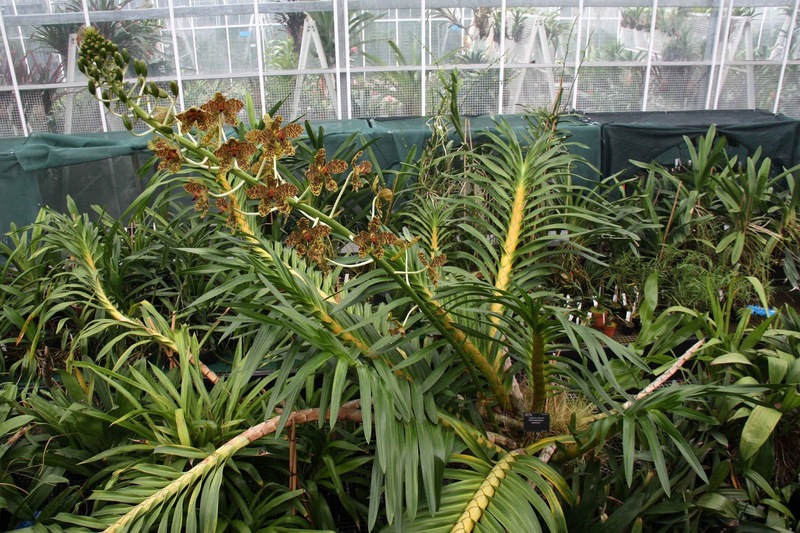 A specimen of Grammatophyllum speciosum, believed to be the largest species of orchid in the world, also known as the ‘queen of the orchids’, is flowering at the Royal Botanic Gardens, Kew for the first time since it was collected 32 years ago from Sabah, Malaysia in 1983. Visitors will be able to go behind the scenes of the Tropical Nursery to view this giant orchid, which has been lovingly cared for by horticulturists at Kew Gardens, ensuring it has enough space, warmth and humidity to grow and produce its stunning yellow blooms with delicate chestnut markings. Currently standing 1.5 metres high, the flower spike is growing around 1.5cm a day, with the spike expected to hit an astonishing three metres. The ‘queen of orchids’ is grown in Kew’s behind-the-scenes Tropical Nursery and visitors will be able to go behind the scenes to view this giant orchid. The OSGB teamed up with the North of England Orchid Society (NEOS) and the Sultanate of Oman Ministry of Tourism to stage a Gold medal-winning display at RHS Tatton Park Flower Show this week. The Sultanate of Oman Ministry of Tourism generously supported the exhibit with sponsorship and the display was organised by NEOS, revisiting the OSGB's Chelsea 2014 exhibit titled The Cosmopolitan World of Orchids. The NEOS team was led by Chris Burrows who got everything to site and even trialled the display in his barn to ensure final building went without a hitch. Val Micklewright and Sam Hurley from the OSGB helped to provide accurate labelling and place plants to maximum effect. Full marks from the judges made all the preparations worthwhile. A large-scale image of Eulophia guineensis, a native of the Sultanate of Oman, graced the rear wall and was framed by orchid hybrids including Paphiopedilum Clair de Lune, trees of Phalaenopsis, mountains of Miltonia along with cliffs of Cattleya and Anguloa. Unusual species were also featured on the display, such as the icy blue-coloured Cleisocentron merrillianum. And a row of Disa hybrids and species added a vibrant border to the front of the display. A Gold medal at Chelsea and full marks across all judging criteria. Congratulations and many thanks to everyone involved in creating this year's display. We couldn't do it without the enthusiasm of our members, the support of our sponsor Albourne Partners and the interest of the Chelsea visitors. Chelsea 2015 - we have finished! A beautiful orchid landscape has emerged on our 8m x 3m site in the Great Pavilion. The build team are weary but satisfied - they have done their best. Huge thanks to the build team, the members who lend their plants, and everyone involved in this enormous task. And particular thanks to Albourne Partners for their sponsorship and support this year. We do hope their guests will enjoy their visit to the show and the gala evening on Monday. When exhaustion sets in building the Chelsea display we simply take a nap under the staging. (Simon was actually just creating space to store our trolleys under the stand). Attention to detail is key at Chelsea and each plant has to be thoughtfully positioned, neatly staked, correctly labelled and beautifully finished, whether it is surrounded by moss or bark, hanging over a cliff, or cascading from a tree. The sides and back of the display are complete and today we will finish the front section. Our three pendent Coelogyne pulverula are opening a little more each day and should be an interesting example to show visitors of how the spikes develop. Thanks to the growing skill of our members and friends of the society, we are able to display Cypripedium calceolus, our British native Lady’s-slipper orchid, on this year’s Chelsea exhibit. The exhibit is sponsored by Albourne Partners Ltd, an independent advisory firm founded and headquartered in the UK and so it is a pleasure to be able to feature British native orchids. This much sought after orchid was reduced to a single wild plant in Britain by the 1930s due to thoughtless over-collecting. Thanks to the Sainsbury Orchid Conservation Project at RBG, Kew seed-grown plants have been successfully reintroduced to various locations in Britain. The beautiful Cypripedium calceolus is now available to buy from commercial nurseries. Terrific progress all round today - the build team are really in their stride. At one point they looked up from their labours to discover they were surrounded by a field of chrysanthemums and a forest of delphiniums. Plants continue to arrive for staging including Aranda Singa Gold and Dendrobium Enobi Purple. 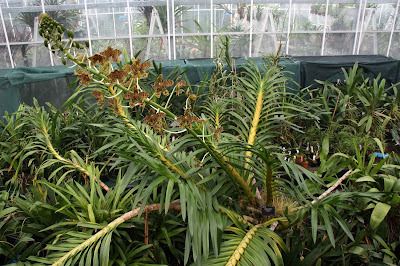 The left hand side of the display is beginning to take shape with a tree covered in Vascostylis Janice Alison. The enormous tub of Anguloa uniflora has found a home and will gradually be incorporated into the landscape. The pavilion is filling up with almost all exhibitors now busy creating their masterpieces. We were never more pleased to be in the Grand Pavilion than yesterday because it was a grim old day at Chelsea for those working outside. Torrential and persistent rain made progress almost impossible although, with only four days to go, many exhihibitors could not afford to abandon their work. Our central mountain range is developing with a group of orchids including Epicattleya Charlie Brown, Phragmipedium Sedenii, Phaius tankervilleae and Oncostele Stirbic on its peak. Ravines run off to the left and there is a sheer cliff on the right over which hang wonderful, pendent Coelogyne pulverula. Displays in the pavilion continue to rise from the ground with unusual items like a giant teapot and an exotic temple from Thailand. Chelsea was once again bathed in sunshine and it was good to see the Great Pavilion being guarded by a watchful dragon. Today saw us hang four beautiful images of British native orchids taken by past President of the Society, Henry Oakeley, along the back wall of our display. A tree of Phalaenopsis Snow Cloud and Miltonia spectabilis is beginning to take shape on the right hand side, along with an asymetric mountain complete with cliff and ravines in the centre. The build team worked hard despite various hiccoughs today and, amongst other jobs, new lights have been wired up and 100 ferns have been watered. Once again we have spread ourselves all over the place and our camp is beginning to sprawl around the pavilion!